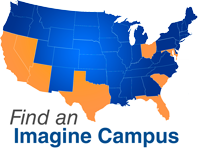 With the recent approval of its application by the Internal Revenue Service, Imagine Schools now serves as a non-profit educational service provider, supporting 63 campuses nationwide. ARLINGTON, VA, August 18, 2015 – Imagine Schools is pleased to announce that it has completed its transition to a non-profit organization. With the recent approval of its application by the Internal Revenue Service, the entity’s educational operations are now entirely non-profit. As a non-profit entity, Imagine Schools will be able to pursue additional partnerships that bring expanded resources to students and campuses in its network. The non-profit status also provides added confidence for stakeholders regarding the stewardship of resources that support the educational operations of Imagine Schools. Earlier this year, co-founders Dennis and Eileen Bakke, who started the organization 11 years ago, generously gifted their entire ownership in Imagine Schools, Inc. to Imagine Schools Non-Profit, Inc., making it possible to complete Imagine Schools’ transition to a non-profit entity. As a result, Imagine Schools now officially operates as a non-profit educational service provider. Additionally, Dennis and Eileen Bakke have decided to step away from day-to-day operational roles as Chancellor and Senior Vice President, respectively, of Imagine Schools as they focus on a new season devoted more fully to their family and community service. The Bakkes will continue to support Imagine Schools as advisers and goodwill ambassadors. Eileen Bakke will continue to serve on the Board of Directors for Imagine Schools.